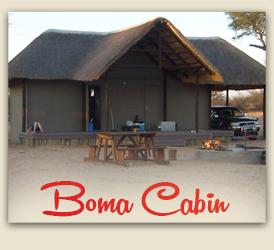 The Boma Cabin is within the hunting camp and consists of two facilities, which can be used together or separately: a cabin, or a self-service camping area. The Phirima Boma cabin has two rooms, each with its own bathroom (toilet, shower and basin) and a thatched deck with thatched carport. There is a little outside kitchen that is equipped with cutlery, pots, fridge – everything you need to prepare a meal. The cabin has its own braai (barbeque) area as well.